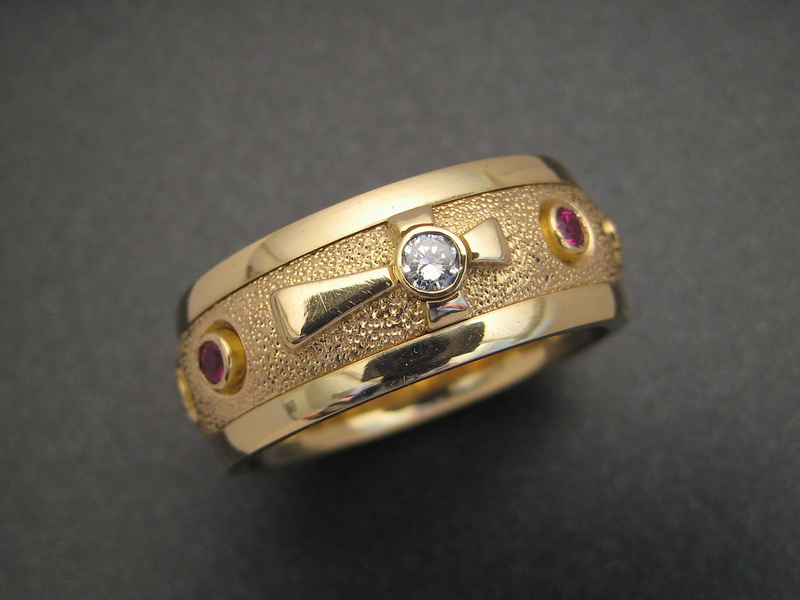 Wedding rings are or should always be custom made. In my philosophy, the individual nature of such a personal item demands the expression of the wearer. Form and function are intricately interwoven, each important, neither more than the other. This ring is a great example of this thought. 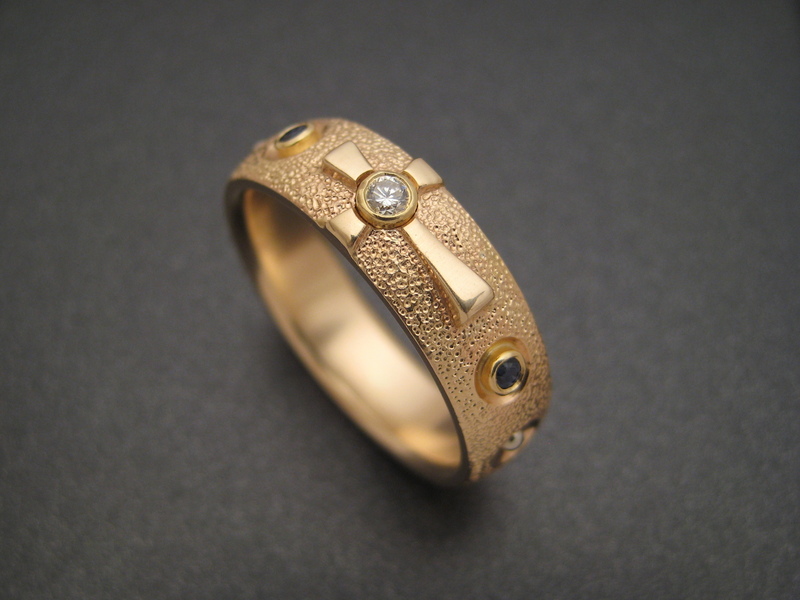 This client came to me several years ago wanting his existing rosary ring repaired. For those non-Catholics reading this, a rosary ring is a small portable stand in for a full string of rosary beads. Its purpose is to help in the meditative act of saying the rosary, i.e., to count the 60+ prayers contained within one recitation of the rosary. This gentleman was a long haul trucker with a million miles to his credit and a devout Catholic. 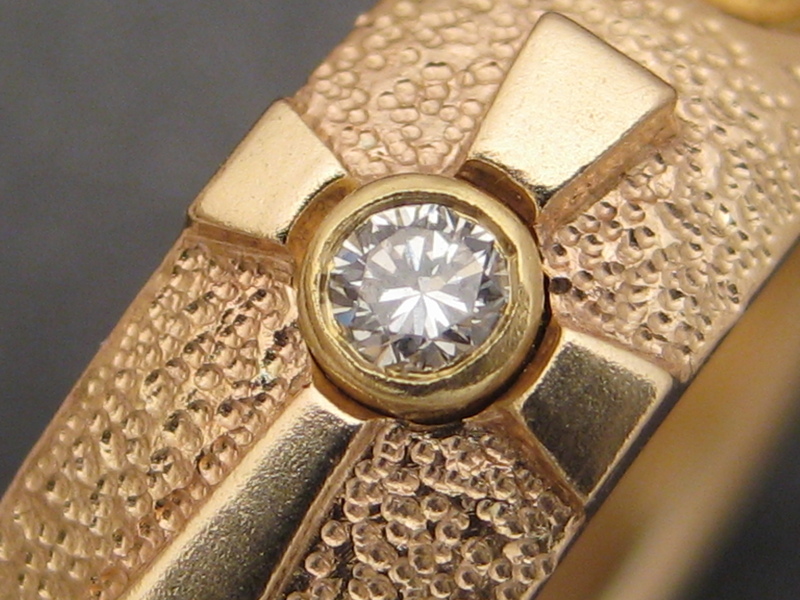 He had worn his ring down to a nubbin leaving nothing to repair so we made this ring instead. 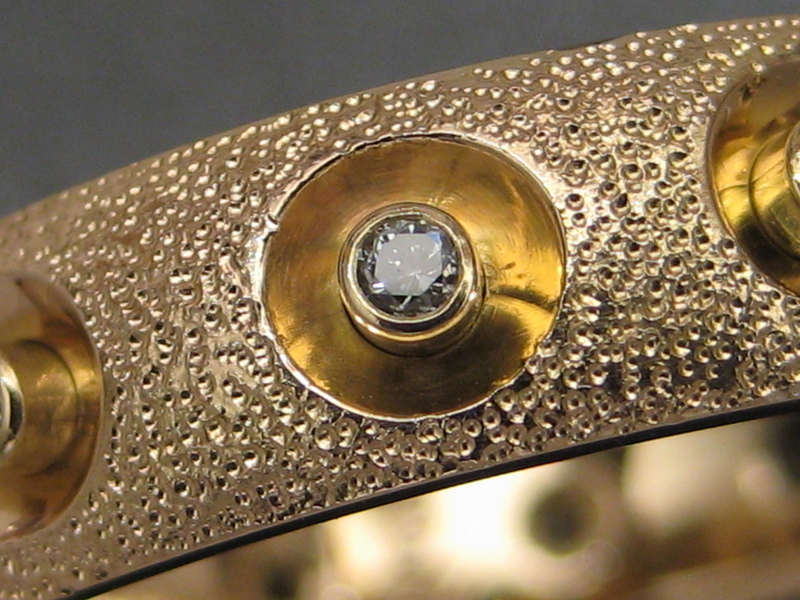 I wanted this design to show the relation between texture and bright finish, concave dishes holding the diamonds and convex surfaces holding the hammered details. 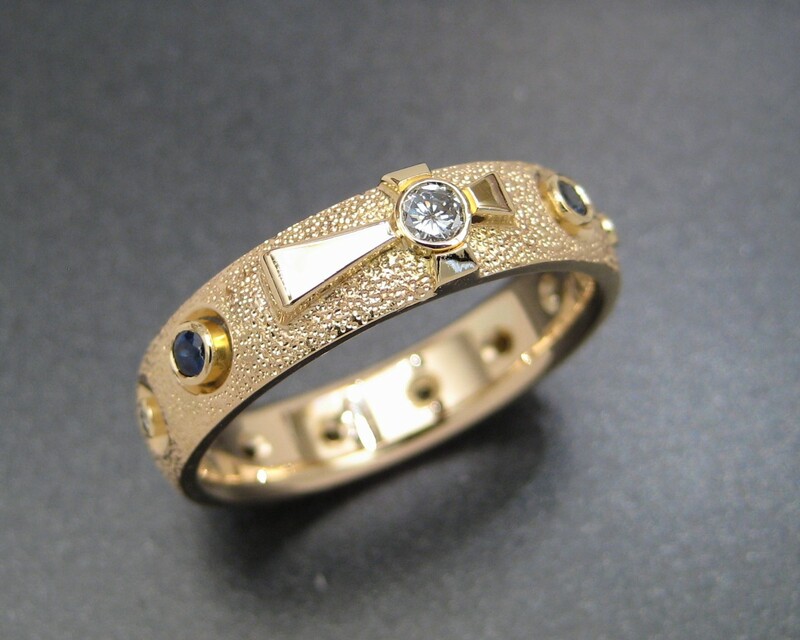 It was initially made with blue sapphires to link it with a custom ring we made for his wife but years later we switched those stones out for rubies. Now begins the fun portion of my tale. Two years after completion, this fine gentleman comes back to discuss modifications to his masterpiece. A large man of bone and girth, it seems that he has taken it upon himself to lose a great deal of weight. So much so that not only does his ring no longer fit, it didn’t fit him by almost 2 sizes. This design being a continuous frieze was not realistically sizeable. The solution I hit on was to make a two piece tubular insert. Piece number consisted of a gold tube in the newer, smaller size with one edge of a frame to hold it in place. The second piece was simply the other edge which fit snugly upon the tube. Once assembled, the inner part of the tube was flared slightly so that everything would hold together. Voile’, another triumph!